1. How to get rid of powder post beetles? 4. How to control powder post beetles? 6. How to control powder post beetles in your garden? 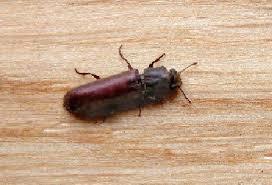 The powder post beetles cause infestation to the wood materials that retain moisture in them. 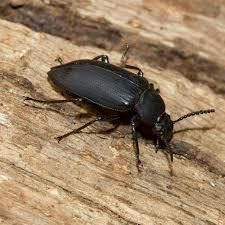 The beetles have a cylindrical and elongated body with a head in the shape of a hood and usually have six legs. The color of these powderpost beetles varies from a blackish tome to a reddish brown tone apart from the larvae which are white in color. They possess wings that are protected through its hardness which gives them a rigid shape with rows similar to a pit. 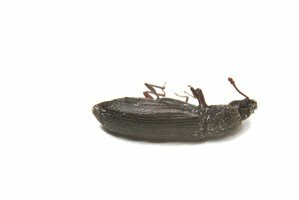 These beetles are found in damp regions having soil or wood, especially in furniture that they infest of the garden soil through which they spread to other materials at a faster rate. They infest and damage almost all types of wood materials when in contact with moisture for a longer span of time. But there are ways to control these insects through effective means from causing a menace to the loved materials. The primary line of defense that one should take in order to stop the powder post beetles is controlling the moisture levels and taking preventive measures that help in the wood preservation. For the scenario where moisture control measures are not possible to be implemented, the complete removal of the infected materials or replacing the same with new materials, especially for wood structures in the only option that the individuals can consider. 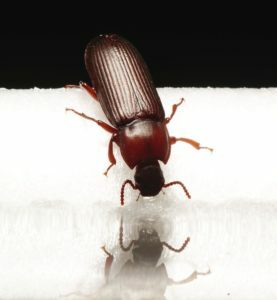 There is a lot of lumber available that contains the chemical creosote; however, newer woods do not seem to contain the chemicals as these are sold as green materials and free from any harmful chemical that can later prove to be toxic to the health of humans but these can be infested with beetles easily. There are even replacements in the present era with all new technological implementations in the form of wood replicas made of fiber which can be used as alternatives and serve beneficial as they do not easily get infestations. Certain localized treatment techniques on the spot can help in resolving all infestation issues. There are a variety of products available in the marketplace for resolving the powder post beetle infestation issues but are effective till the wood is sealed or covered, finished, varnished, and painted. The main concern that underlies the infestation issue is its direct form of treatments as the powders available for the control techniques do not effectively serve in preventing the powderpost beetles from penetrating the paints, varnish, or the stains. In most of the conditions, the direct way of treating the wood is the most desirable option until the unfinished side of the wood is exposed. These unfinished sides can be sanded in order to allow the powder to penetrate and control pest infestations. The treatment that implements spraying techniques using the water-based chemicals tends to roll down simply like water at times or evaporate. However, proper sanding of the wood and applying the pesticide in an effective manner so that it can penetrate makes the direct treatment worth of their service. There are certain situations in which pesticides can be injected in the wood using an injector or needle. This needs the wood to be drilled at the infected spots that can form galleries and pathways for the chemicals to flow in and disinfect the materials by killing the underlying powder post beetles and preventing them from spreading. This is considered to be a direct form of prevention and control technique that serves to be beneficial in controlling the pests. The treatments once are done, need regular inspections over a period of time to check if the powderpost beetles still exist or if they are spreading in spite of the disinfection techniques applied. In certain cases, the inspection reveals that certain parts of the woof materials need replacement due to a high rate of infestation before the treatment that might have caused greater damage to the materials and that is still prone to the infestation in future. These structures need to be removed or replaced with a whole new structure. Regular inspection- The inspection can be done anytime and at any doubted material that seems to have attracted the powderpost beetles or is considered to be infected. This reduces the chances of their growth is determined at the early stages. The furniture made of wood can be fumigated if there are visible signs of infestations. The fireplace needs regular inspection as these are the places that usually have raw wood blocks. Placing the infested materials in cold temperatures- This is also one of the most effective home remedies for disinfecting the structures that are infested with powder post beetles. Colder temperatures tend to control and kill the powder post beetles in the most effective manner. The infested materials must be removed from the warm places and must be placed in locations that have colder temperatures for at least a couple of days. In order to make sure that this form of treatment has served to be effective, the object can be removed from the colder place after at least the timespan and must be placed back in the warmer locations for another couple of days. This step needs to be repeated for two or three times for effective control. It is not the cold that helps in killing the powder post beetles but is the huge change in temperatures that are against their survival and reproduction norms. This helps in controlling the infestation to a greater extent and preventing the powder post beetles from causing huge damage to the wood materials. 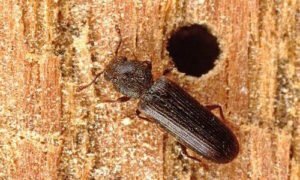 Using a kiln or furnace- The powderpost beetle infested materials can be placed on a furnace or kiln to remove the moisture out of the object completely. This is the most effective techniques for removing infestations for smaller wooden objects. On passing heat through the material on a constant basis, the powder post beetles can be controlled but only to a limited extent. After the wooden materials become completely dry, the object must be completely sealed with the help of paint cover. Eliminating the suitable conditions for powder post beetles- The moist and dry environment, especially in wood structures are the most liked places for the powder post beetles to live, eat, and multiply, ultimately causing greater damage the place where they reside. The closer is these conditions near a house, the chances of these powderpost beetles to infest inside becomes more and more with passing the time in case the infestation levels are not adequately controlled. An individual must thoroughly clean and adhere to all the possible infestation techniques at the primary level near the dead branches, scraps, and wood spread nearby the house. 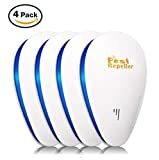 Moisture reduction- On effectively reducing the air levels, moisture can be controlled, and this helps in limiting the sources of the of the powder post beetle’s survival. The areas where moisture is less than thirteen percent proves to be deadly for the powder post beetles. Installation of moisture barriers at home and near the places of infestations prove to be a great controlling source and effectively helps in increasing the levels of ventilation. Sprinkling salt- One of the most common home treatment and garden control techniques for powder post beetles is the sprinkling of borate salt on the infected areas. Visible changes can be noticed by sprinkling the borate salt on thin wood, but this is not of much help when sprinkled over thick and dense wood structures and materials as the penetration power is less. Replacing the infested wood- In spite of killing and opting for the technique including the hassle of disinfecting the wood, it can be completely replaced with a new one. This technique is also feasible for smaller areas including panels and moldings made of wood but incurs huge costs to replace wood materials of higher value and size. Using essential oils at home for disinfecting- Essential oils like eucalyptus, basil, and tarragon helps in killing the powderpost beetles if applied for three continuous days. Among all the oils, the most effective one for killing the powder post beetles at home and in gardens is cedar oil. Removal of unfinished woods- The woods that are unfinished tends to attract more powder post beetles when exposed to moisture, therefore coating them with paint, varnish, and shellac helps in the preservation and prevents the infestation from happening. In case an infestation occurs in rough cut lumber, it must be taken to the sawmill and placed on a kiln to dry it out completely. This helps in killing the adults, larvae, and the eggs. In order to treat the smaller wood materials and parts, it can be placed in a freezer at a temperature of 0 degrees for a minimum of two to three days. This also helps in the effective killing of the adults and the larvae; however, there are probabilities of some of the eggs to survive, so a regular inspection on the same is needed. At home, the elimination and control of infestation seem complicated, but the most effective purpose is served by the borate salt containing pesticides. These can be found in the form of liquids and powders and must be mixed with water before they are applied. It can also be sprayed or applied with the help of brushes on the infested areas of the wood. Pesticides cannot effectively penetrate in absolutely dry wood structures and kill the adults and larvae inside. This is why water needs to be mixed with the solutions or powder so that the chemical can penetrate the wood and perform the task easily. However, retreatment is always necessary for a span of every five to seven months from the application time. Natural wood treated with chemicals, though non-hazardous, must be checked for guarantees before they are purchased and made into furniture or other objects either for home or for the garden areas. Natural and old lumber that is already infested must not be used. Untreated natural woods must not be used. The moisture levels must be optimized to the minimum where the chances of infestation are high. Increasing the ventilation in the area that has damps is of utmost importance, especially for wood blocks in covered structures in a garden. This helps in adequate evaporation of rainwater and moisture for the exposed wood items. Inspection at a regular instance is the best natural technique to check for any signs related to damage of materials. 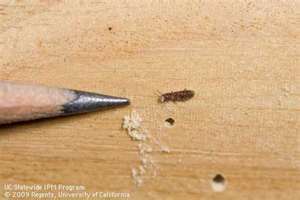 Wood materials in a garden often tend to incur infestations from powder post beetles due to their exposure to the outside temperatures, especially in the monsoons. Garden control can be done with the help of chemical spraying on the wood items and the soil but often tends to be harmful to the fauna environment. However, alternate control methods can be used in the form of regular inspections, replace and removal of infested objects, cleaning the excess wood materials like branches; rugs, dried leaves, and unwanted shrubs can contribute to the control measures. Other methods that can be readily adapted are painting of the open wooden fences and structures with a pesticide labeled paints and application of insecticides to the soil. Unfinished woods must be coated and varnished, but these are not deep treatments as these can be done to prevent infestations but never provides a complete cure for the whole cause. Application of borate salts and solutions can help in the elimination process as they tend to penetrate and kill the powder post beetles in dry wood. The surface application is not always an active solution that can eliminate the root cause, but these can serve as temporary solutions to the infestation issues. Other natural techniques involve ventilation and moisture removal of all wooden and object, as well as from gardens too. Fumigation is often considered as costly procedures and sometimes hassle related s the complete areas needs to be airtight with gases spread to penetrate and kill the powderpost beetles. The process takes place generally for two days as re-airing space is also needed before it can be reoccupied again. The costs are very high and can even rise up to a few thousand dollars for a mid-sized house treatment. 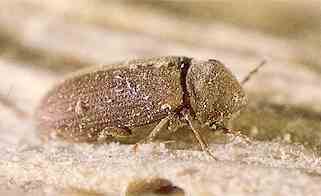 All the stages of powder post beetles can be killed using the kiln drying process. However, this is not only the sole process to actively eliminate the infestation as other options and control measures are required for treating the wood on a regular basis. Spreading salt in burrows on wood infested by powder post beetles is another great alternative but is only temporary. These can easily penetrate the surfaces that are unsealed, and the later can be painted with labeled pesticide paints to kill the larvae and adults inside when they tend to come out. Sealing and painting over the newly infested surface areas can be another natural solution at home. Non-toxic preservatives for wood preservations are available to treat the infested woods outside the homes, probably in gardens and the objects in contact with the soil. Use of essential oils, especially cedar, eucalyptus, and basil helps in active prevention of the infestation by the powder post beetles. These oils tend to be harmful to the pests and effectively kill them. But the major concern related to their application is the penetration and reachability power to the burrows and holes made by the beetles. The treated areas need re-treatment over a short span of time but prove to be effective without any involvement of massive costs. Borate salts and boric acids are household agents that can treat the infested areas and kill the powder post beetles. Before the application of the salts, the areas must be completely free from any moisture content. After the application, a yearly inspection of the same spots can help in detecting the risk factors related to the regrowth of the powder post beetles. The infestations caused by the powder post beetles alarmingly concern all the homeowners to a great extent. The diagnosis of the root cause must be done in an adequate manner to determine the exact activeness of the infestation. This can also determine the treatment time and the treatment step. Among all other considerations the location, age, moisture level, condition, content, and type of infestations are the primary points for determination.